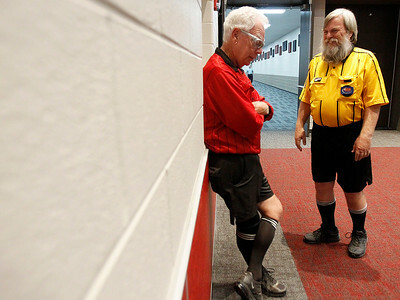 Matthew Apgar - mapgar@shawmedia.com Referees Bob Crumrine of Lake Barrington, left, and Bob Hansen of Crystal Lake wait out a rain delay before the boys soccer game between Huntley and Crystal Lake South on Thursday, Oct. 08, 2015 at Huntley High School in Huntley. Huntley won 5-1. 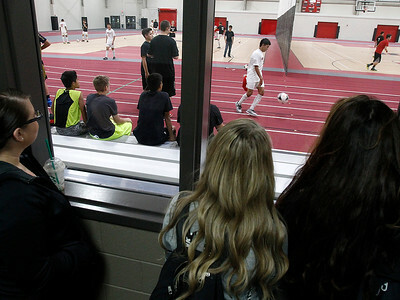 Matthew Apgar - mapgar@shawmedia.com Amy Cazares, left, Sarah Price, center, and Emily Ruis, both 15 and all of Huntley, watch through a window as the Huntley boys soccer team stays warmed up during a rain delay before their game against Crystal Lake South on Thursday, Oct. 08, 2015 at Huntley High School in Huntley. Huntley won 5-1. 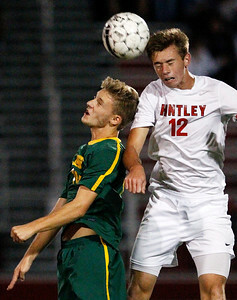 Matthew Apgar - mapgar@shawmedia.com Nikolas Getzinger of Crystal Lake South, left, goes up for the header with Huntley's Jason Zobott, right, during their boys soccer game on Thursday, Oct. 08, 2015 at Huntley High School in Huntley. Huntley won 5-1. 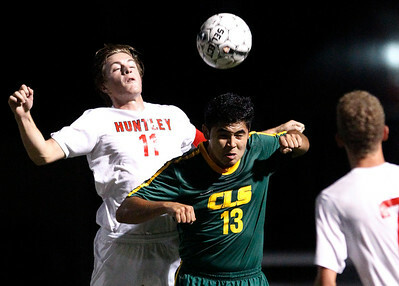 Matthew Apgar - mapgar@shawmedia.com Huntley's Kyle Carberry, left, goes up for a header with Carlos Merida of Crystal Lake South during their boys soccer game on Thursday, Oct. 08, 2015 at Huntley High School in Huntley. Huntley won 5-1. 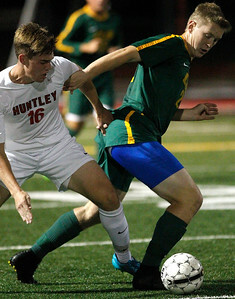 Matthew Apgar - mapgar@shawmedia.com Jake Canfield of Crystal Lake South, left, battles for control of the ball with Huntley's Allesandro Vergara during their boys soccer game on Thursday, Oct. 08, 2015 at Huntley High School in Huntley. Huntley won 5-1. Matthew Apgar - mapgar@shawmedia.com Alex Ligeza of Huntley connects with a header against Crystal Lake South during their boys soccer game on Thursday, Oct. 08, 2015 at Huntley High School in Huntley. Huntley won 5-1. 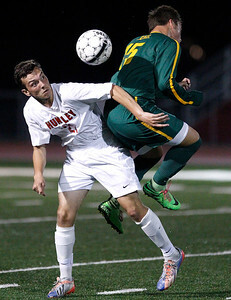 Matthew Apgar - mapgar@shawmedia.com Huntley's Zack Whitaker battles for the ball with Andrew Grabowski of Crystal Lake South during their boys soccer game on Thursday, Oct. 08, 2015 at Huntley High School in Huntley. Huntley won 5-1. 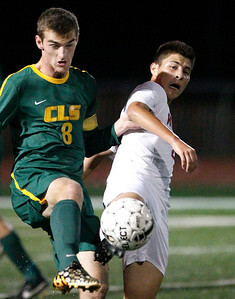 Matthew Apgar - mapgar@shawmedia.com Huntley's Andrew Meyer braces for impact with Zach Bimbi of Crystal Lake South during their boys soccer game on Thursday, Oct. 08, 2015 at Huntley High School in Huntley. Huntley won 5-1. 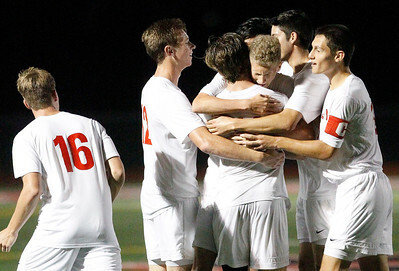 Matthew Apgar - mapgar@shawmedia.com Huntley celebrates a goal against Crystal Lake South during their boys soccer game on Thursday, Oct. 08, 2015 at Huntley High School in Huntley. Huntley won 5-1. Huntley's Zack Whitaker battles for the ball with Andrew Grabowski of Crystal Lake South during their boys soccer game on Thursday, Oct. 08, 2015 at Huntley High School in Huntley. 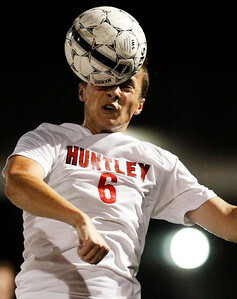 Huntley won 5-1.